Rediff.com » News » PHOTOS: It's an odd world out there! PHOTOS: It's an odd world out there! 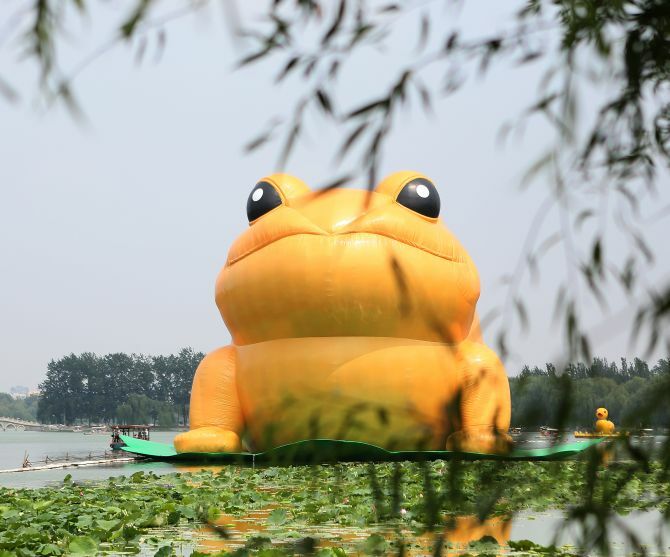 These 12 images show that we truly live in a bizarre world. Three men sit and cool off in a fountain in the center of Lyon. 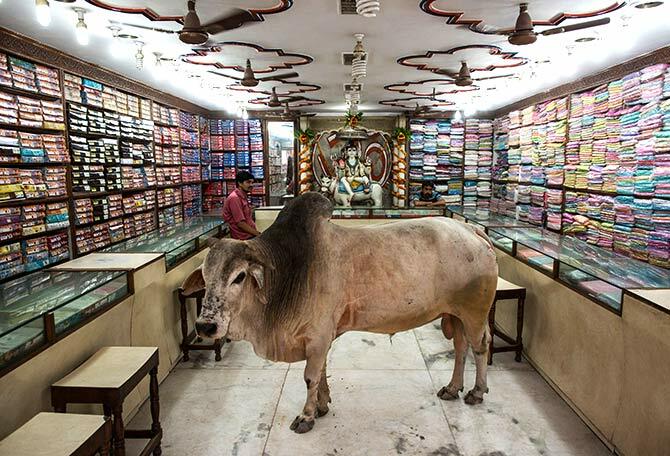 A bull stands inside a shop selling clothes at Varanasi, in Uttar Pradesh. 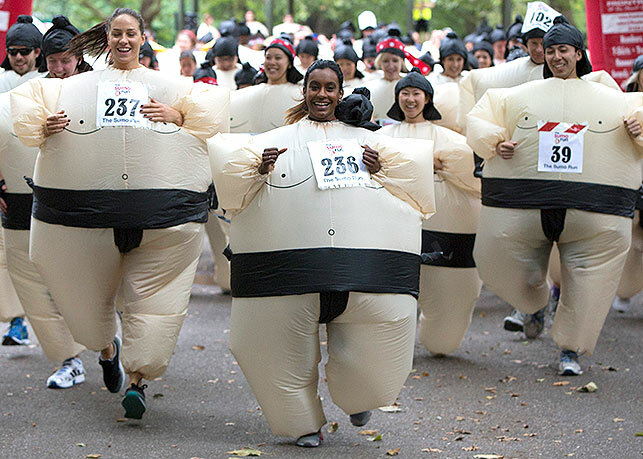 Participants take part in the Sumo Run in Battersea Park, London. The runners, wearing inflatable costumes, take part in the kilometre run with the aim of raising money for a charity to help educate children in Africa. 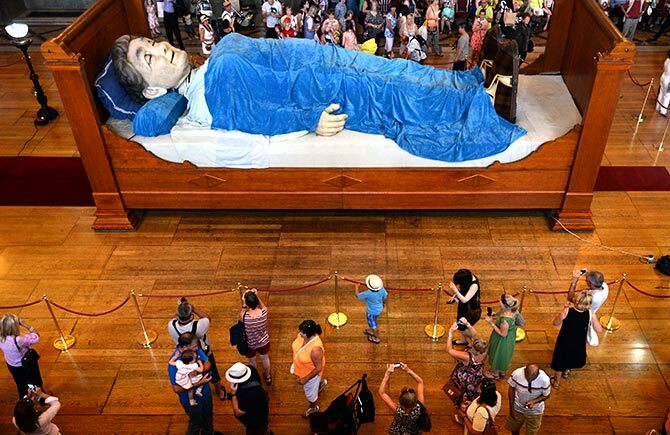 Visitors look at a giant puppet of a grandmother sleeping on a bed inside St George’s Hall in Liverpool, northern England. The grandmother is one of two giant models as part of the ‘Memories of August 1914’ World War One commemorative event happening over the weekend in Liverpool. 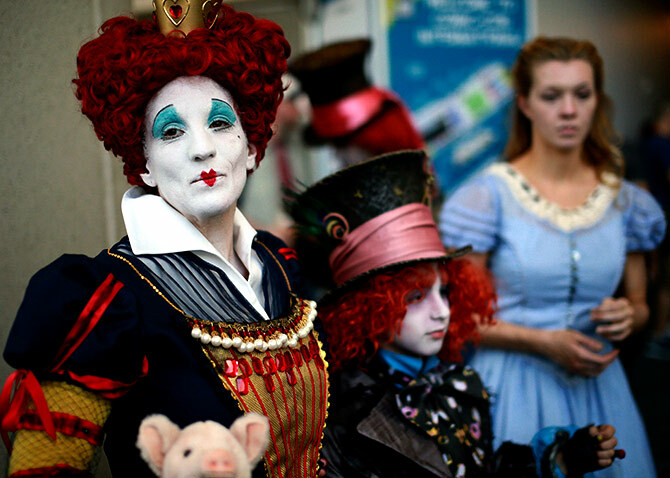 Lori Roulette, dressed as a character from Alice in Wonderland attends the 2014 Comic-Con International Convention in San Diego, California. 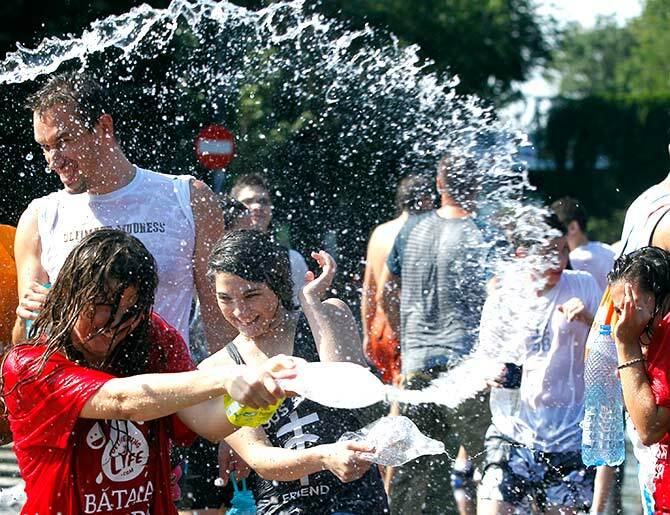 People enjoy a water fight in downtown Bucharest. About 10 tonnes of water were used during the event organised by local authorities under the name Deliver Life. Matt Gone, also known as ‘The Checkered Man’ poses during the GuateMayan Tattoo Convention in Guatemala city. 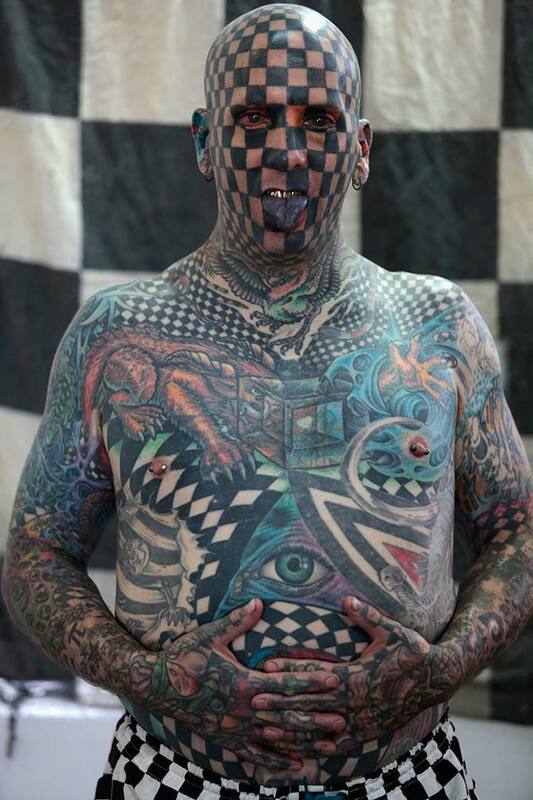 Gone claims to be one of the most tattooed people in the world, with 98 per cent of his body inked. Jeremiah Gerbracht rides his Harley Davidson motorcycle with his dog on Wilshire Boulevard in Los Angeles, California. 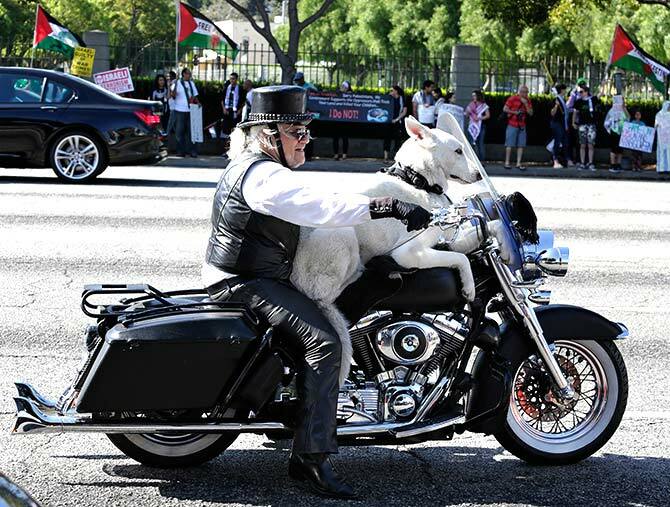 Gerbracht, a retired dog trainer, won a court ruling in 1996, allowing him to ride his motorcycle with a dog on board. 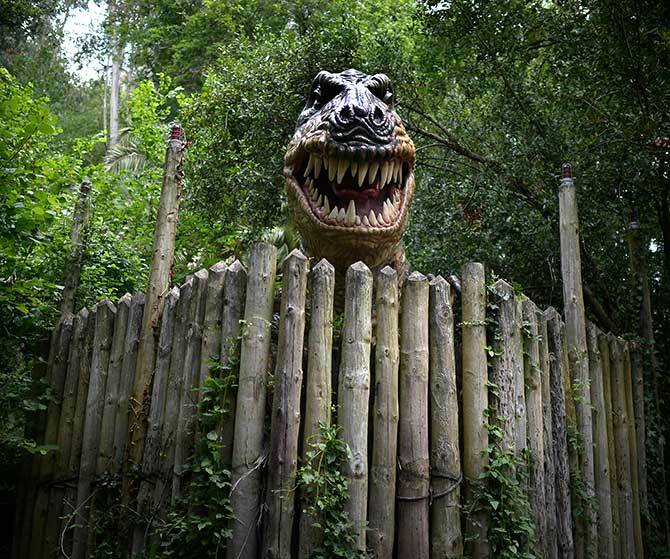 A life sized model of a Tyrannosaurus Rex baring its teeth is seen at the Karpin Abentura park in the Karrantza valley, 50kilometre from Bilbao, Spain. The park, housing wildlife and model dinosaur areas, reopened on Saturday following damage due to heavy rains. According to the information plaque, the T-Rex was a seven tonne meat eating dinosaur that lived in open forests with nearby rivers and swamps 85 million years ago. Women prisoners celebrate as they play soccer before a dance competition inside the Maximum Security prison of Chorrillos in Lima. 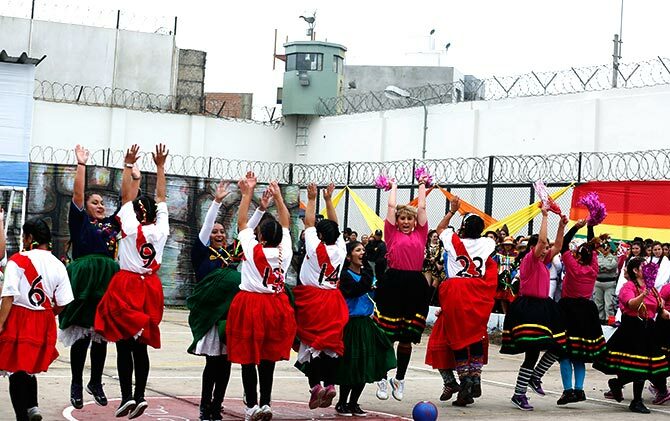 The National Penitentiary Institute organised a folk dance competition with four women’s prisons in Lima during the celebrations of the Independence Day in Peru. Peruvians celebrate Independence Day on July 28. 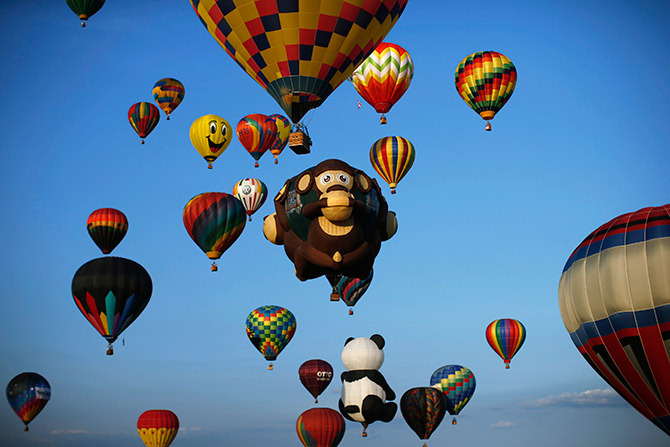 Balloons fly during the 32nd annual QuickChek New Jersey Festival of Ballooning in Readington, New Jersey. 14 PHOTOS that prove it's a mad world out there!